Good news for (future) owners of the Promise Ultra100 (also sold under different brands like Maxtor): with a little trick you can convert the Ultra100 to a Promise FastTrak100 RAID controller. Typically, these more expensive controllers, have RAID capacities which can improve harddisk speed, security or size by combining drives. More information on RAID can be found on my "What is RAID ?" page. 1) This trick will not work with the newer Promise Ultra 100 TX2 controllers! 2) This hack will void warranty of your Promise controller! I bundeled the required for the floppy, download the zip here. Make sure the Ultra100 works OK.
Make a backup (if you would like to keep the data)! I used Plextor CD-RESQ but Symantec/Norton Ghost and PowerQuest Drive Image offer similar functionality. 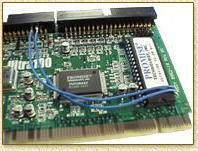 Windows 2000 users: before you can boot from a RAID array, Windows 2000 must know this type of controller. The easiest way to do this is by replacing (updating) the Ultra100 drivers (in Device Manager) with the Fasttrak100 drivers. Windows 2000 will complain that these are not the proper drivers - ignore it and continue. Make a driver and flash floppy, download the files here. If you are about to reinstall your entire system: the driver disk of the Promise Fasttrak100 will be requested by Windows NT4, XP and Windows 2000 setup. If you are about to use used diskd (ie. with partitions on them defined), then make sure to clean this disk by using FDISK AND REMOVING ALL PARTITIONS ! Do not forget this ! It will save you a lot of trouble. 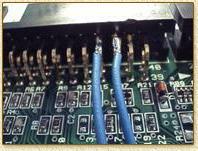 When soldering the BIOS-chip, make sure to not overheat this chip: it is heat sensitive! C - BIOS flashing of the controller and the drivers of the operating system you're using. 1. 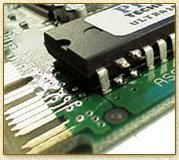 Cut pin 2 and pin 3 of the BIOS chip. Now cut pin 2 and pin 3, I used a scalpel but a small wirecutter should do the job as well. Pay attention here: only to IDE-2 !!! 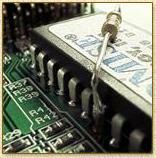 next solder a wire from BIOS chip pin 3 to pin 33 of IDE-2. Note: Left, below the IDE-2 connector you will see "IDE2" (the left connector that is). Note: Be carefull with the BIOS chip, it's heat sensitive! Note: Be carefull not to shortcut the BIOS chip with other pins or the PCB ! We now need the BIOS file (A:\BIOS\FT100130.BIN) and the proper flash-software version 1.09 (A:\BIOS\PTIFLASH.EXE) which should be placed on a floppy (download files here). Insert the controller in to the PC (which is switched OFF ofcourse). Place a DOS boot floppy in the A-drive. After a while you will see the DOS prompt (A:\>). If not: reset your computer and check the BIOS of your PC to see if the A-drive is bootable. Create a backup of the Ultra100 BIOS. The BIOS will now be flashed, after a few seconds the software will ask you to restart your PC. 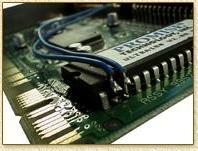 (c) 1995-2000 Promise Technology, Inc. All rights reserved. Switch OFF your computer: flashing the BIOS was succesfull. It appears to be required for some drivers, so let's just add these resistors, it is not always required though - it's up to you what you want - I choose to add them. After placing these resistors, you can put the controller back in the PC and connect the harddisk(s). Enjoy your new cheap RAID controller ! 1. The key combination (during boot) CTRL+F allows you to enter the BIOS settings of the FastTrak100, here you will also find the automatic setup making setup easier. 2. The controller can still be used similar to the Ultra100. Create an array for each harddisk holding one disk per array. 3. You might encounter problems with FDISK (with large diskcapacity) - Windows2000 setup does not appear to have these problems. 4. There have been rumours that Seagate disks don't work well with this RAID solution - it's probably just a matter of BIOS version updates that will fix this problem. 5. Always use PTIFLASH version 1.09 (download here). Other versions will not work with the controller and will not support the /Unlimit option. 6. Partitions that have not been removed before putting them in an array will cause confusion for both you and the partitioning software. Most likely you cannot remove these partitions when in array mode. See problem/question 2 and remove the partitions with FDISK, reboot and make a new array. 7. Windows2000, XP and Windows NT need the driver diskette of Fasttrak when installing Windows (download here). 8. Yes! Windows2000 professional (the not-server version) supports RAID. 9. The /Unlimit option is case sensitive. 10. Check the Promise website for common problem solutions and new tools and drivers: http://www.promise.com.